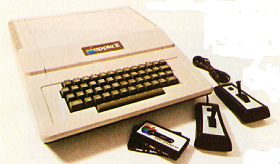 In this BYTE article from May 1977 Stephen Wozniak describes the hardware and system software in the then brand new Apple II. Circuit diagrams and BASIC listing are included. This article first appeared in the May 1977 (Volume 2, Number 5) issue of BYTE. To me, a personal computer should be small, reliable, convenient to use and in expensive. The Apple-I, my first video oriented single board computer, was designed late in 1975 and sold by word of mouth throughout California and later nationwide through retail computer stores. I think that the Apple-I computer was the first microprocessor system product on the market to completely integrate the display generation circuitry, microprocessor, memory and power supply on the same board. This meant that its owner could run the Apple BASIC interpreter with no additional electronics other than a keyboard and video monitor. The Apple-I video computer board was originally intended as a television terminal product which could also operate in a stand alone mode with out much in the way of memory, although it did have a processor, space for 8 K bytes of 4 K dynamic memory chips, and its shared video generation and dynamic memory refresh logic. Apple- I was sold as a completely assembled and tested processor board with a price under $700 at the retail level. The latest result of my design activities is the Apple-II which is the main subject of this system description article. The Apple-II builds upon this idea by providing a computer with more memory capability, a read only memory (ROM) BASIC in terpreter, color video graphics as well as point graphics and character graphics, and extended systems software. 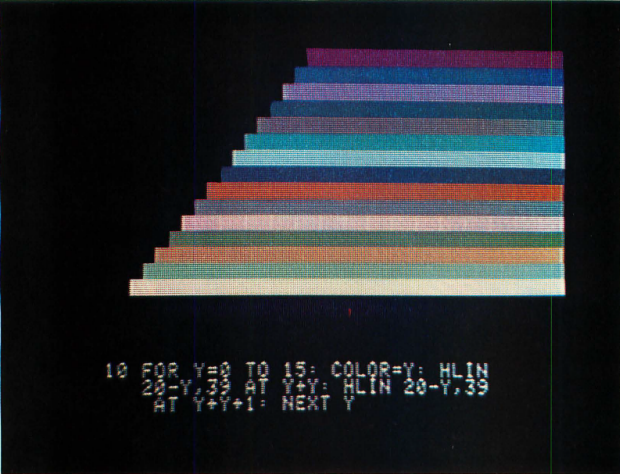 Photo 1: A color test chart showing the 75 shades of hue available from the Apple-II as presented on a typical commercial color set, using one of several RF modulators available on the market. The Apple BASIC program used to generate this color is shown in the text portion of this split screen (graphics and text) display. Color graphics, in which each 4 bit nybble of the byte is treated as a color definition code by the color generator. Character generation in which the 8 bit code is processed with a read only memory to generate a dot matrix pattern which is serialized and sent to the video multiplexer. Black-white point graphics in which the 8 bit word from memory is used to control the contents of a segment of a 280 by 160 point grid. Since the Apple-II incorporates this display generator as a part of its design, its text mode becomes the terminal for the system. The display has 24 rows of 40 characters displayed on an ordinary black and white or color television screen. Each character in the Apple-II design is a 5 by 7 dot matrix, so the present version of the system only implements upper case characters of the 6 bit ASCII subset, as well as the usual numbers and graphics ava il ab le in sta ndard character generator read only memory parts. 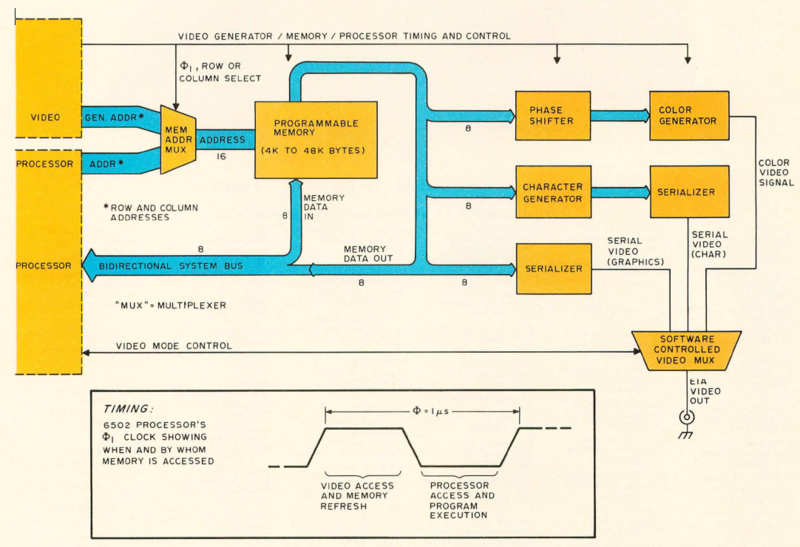 Assuming that the video display is the currently assigned system output device, the display is accessed through our system software in read only memory by using a subroutine called COUT which adds text to the screen using an automatic scrolling technique. This is typical of the many read only memory routines which I've incorporated into the ROM to provide complex features with relatively simple user interfaces. Another example of such a software feature is a user definable scrolling window. This means that the user of the system can pick any of four coordinates defining any rectangular subset of the viewing area of the video screen as the current scrolling zone. The remainder of the display will remain frozen and data in the window will scroll normally when COUT is accessed. This is a most useful feature: For example, the user can set up a game background or instruction menu in one part of the screen while using the remainder of the screen for scrolling the variable data.